Say so long to Soylent, Canada. At least for now. 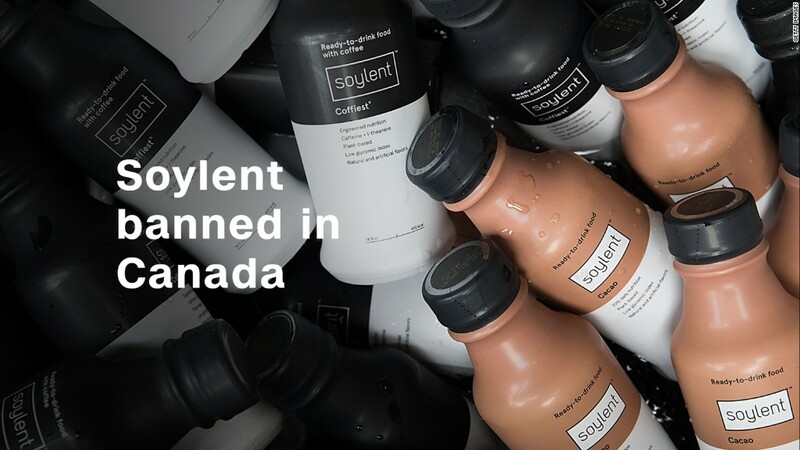 The meal-replacement maker said that the Canadian Food Inspection Agency is blocking sales of Soylent in the country. "Our products do not meet a select few of the CFIA requirements for a 'meal replacement,'" Rob Rhinehart, Founder and CEO of Soylent-maker Rosa Foods, said in a letter to Canadian customers. "Although we feel strongly that these requirements do not reflect the current understanding of human nutritional needs, we respect the CFIA's regulations and will fully comply with any regulatory action they deem appropriate," he said. In a statement, Rosa Foods said it "is working hard to resolve the categorization issue with the CFIA as quickly as possible so we can continue to provide complete, quality nutrition to our community in Canada." Until then, the company cannot ship any product to Canadian warehouses or sell Soylent to Canadian customers. Soylent touts itself as the world's "easiest nutritional food," engineered to contain protein, carbs, lipids and micronutrients. Mixed with water, its powder becomes a thick, chalky substance that many in the tech world have used to "hack their diets" -- otherwise known as a meal replacement. Rhinehart caught the public's attention when he developed his product in 2013 as a solution for Silicon Valley entrepreneurs too busy to chew, and too broke to invest in healthy meals. Since then, the startup has charmed investors: The company said in May that it had received $74.5 million in funding by that point. It counts Lerer Hippeau Ventures and Andreessen Horowitz among its investors. The Soylent website boasts that each of its products "contains a complete blend of everything the body needs to thrive." But nutritionists were skeptical of the company's meal-replacement promise when Soylent first arrived on the scene. And last year, the company faced another hiccup when it recalled its Soylent Bars after finding that they were making some people sick. The company started selling to Canadian customers in June 2015. Canadian customers with a Soylent subscription will not be charged for unavailable products.